IC : Natsuki then flash stepped behind him and formed a Axe with a SERATED Edge , And Slashed His Back , then started to flip backwards . "Fine , im serious now " Instead of Blocking she attacks hit Attack , She Swings her Axe Heavily against his Sword , and whispers "Mouve La Poine" Her Axe Covered in Purple Reiastu , then with her right arm She Summons A Reiastu And Stabs at His Chest . OOC : Even If you block you will still get hurt internally and i can move fricking fast . Natsuki Not Suprised Flips Back , and Looks at The other shinigami sheepishly . But Looked back at the fake Kenpachi , " Nice ? your a ... light bulb ? " Suddenly A Large Arm Blade Appeared On her Arm , And On her left arm A Fist Appeared With an Odd TIp . " Heh , I don't think your Skin can with stand a Vibroblade , thats heated with temperatures thaat would instantly melt Titanium . " IC : Suddenly The Fist On Her left Arm Shattered And Morphed Into a Large Shield , As Is Stopped the Blast , From Behind the Shield Instantly came A Binding Spell 63 . Rikujokoro . Then In That Instance Natsuki Flash Stepped Above you and Used Hado . 66 Soreno Sokatsui , THe Large Destructive Blast . 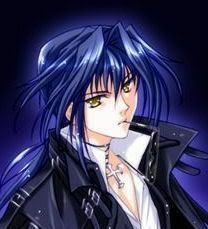 *Looks behind him and slashes his sword at the cero his reatisu unleashing from a blade and get knocked back slightly bleeding from his head as he gets back up and smiles* "Dammit..."
*Sieraku does not purse him and growls as his zanpaktou shatter away into darkness he walks over to Belle* "Are you alright?" Natsuki smiles " Hmm ? My wounds Don't Matter , thanks for your concern. " Natsuki holds out her arms " Odin's Spear " Suddenly A Weapon Forged From Over Thousands of Years ago . " I suggest you don't get hit by this weapon "
Subject: Re: Urahara???? Or not??? ?